On Monday, U.S. Bankruptcy Judge Steven Rhodes made a landmark decision to authorize continued water shutoffs for unpaid water bills, leaving thousands of Detroiters without access to water. At the same time, though less reported, some 20,000 Detroit residents stand to lose another basic human right — their housing — as the Wayne County Treasurer prepares to carry out mass tax foreclosures across the city. In October, the Wayne County Treasurer will host an online auction to sell properties whose owners owe back taxes. According to the county website, over 26,000 properties are up for auction, over 90% of which are in Detroit. Of these, 23,000 made it into Round 2 – where auction prices start at a mere $500. These aren’t just empty lots and vacant buildings; rather, an estimated 10,000 are occupied properties, which means that at least 20,000 people face imminent eviction. 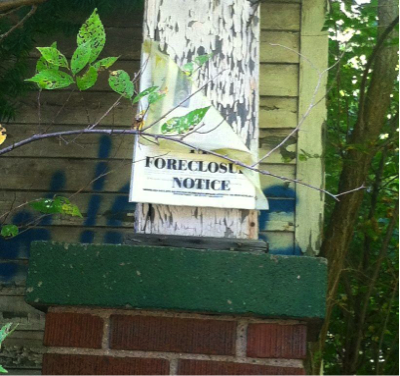 Unopened Tax Foreclosure notice on an abandoned house in Detroit’s Littlefield neighborhood. Motor City Mapping indicated that nearly half of the properties in this neighborhood (3,840) are unoccupied. Already nearly every block in Detroit has been affected by evictions. But tax foreclosures are growing rapidly each year — from 10,000 in 2013 to 100,000 projected in 2015. There under 400,000 properties in the entire city. If Detroiters facing foreclosure knew they could buy their home for as little as $500, they’d jump at the chance. But local government does the bare minimum to inform those people who could benefit most. Foreclosure notices don’t even mention the auction, let alone the auction website. And even if residents knew about it, those who don’t have internet access or aren’t web savvy can’t participate. So most homes will be sold to someone other than the resident — someone in New York who reads Curbed, someone in China who attended the three-day “Buying Detroit” convention, someone with no intention to visit the property before buying, let alone live in it. 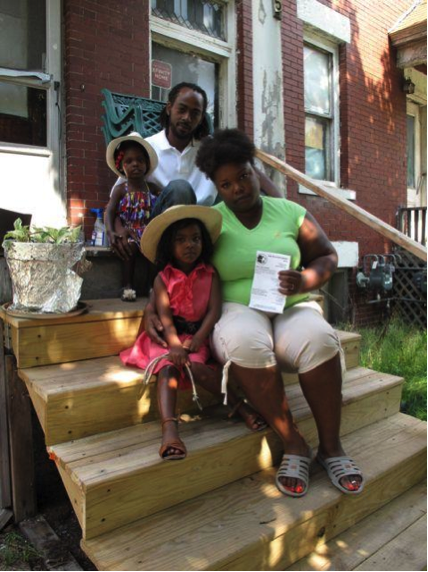 The people who purchase occupied properties will likely evict current residents, starting a cycle of displacement and blight that will cost the individuals, the owners, the community and the city in the long run. But the new owners investing in Detroit will be in for a surprise because even properties listed in “good” condition at auction may never turn a profit. In today’s economy, just as it’s harder to get a job unless you’re already employed, it’s harder to occupy a home unless it’s occupied. As soon a house becomes vacant in Detroit, scrappers break in, strip out wiring, plumbing and appliances, and remove anything of value. Over time, rain and snow blow in through broken windows, pipes burst and animals or squatters take shelter. As the recent blog phenomenon “GooBing Detroit” showed, a lovely home can become an uninhabitable eyesore with shocking speed. The city is taking measures to ensure that owners either rehabilitate or demolish their properties, but the best approach is to avoid blight in the first place. Like so many others facing a similar crisis, Oscar had no knowledge of the online auction and the opportunity to buy back his home. Detroit is bankrupt so it’s understandable to see aggressive measures being taken to come up with money wherever possible. But even when Wayne County makes back all unpaid taxes at auction, foreclosure on occupied homes with create costs far greater than those owed. Some properties are foreclosed for laughably small debts (as low as $1,900), but if that property becomes blighted and ends up in the hands of the city, Detroit Land Bank Authority can expect to pay $10,000 to $12,000 for demolition. Whether they stay or go, people displaced by the foreclosed homes can also have very expensive unintended consequences, including decreased population, reduced enrollment in schools, increased homelessness and a general fragmentation of the community. While foreclosure on Detroit’s occupied homes appears to be a policy of mutually assured destruction, the good news is that it’s preventable. For starters, property values must be reassessed so that taxes reflect actual market rates. Furthermore, foreclosures should only be executed if debts exceed a reasonable portion – say 10% – of property value. Michigan must revise its mandate to foreclose properties with three years of unpaid taxes. And all levels of local government should work to notify property owners at risk of foreclosure and offer reasonable options to avoid it. If those measures fail, renters should receive the first option to buy the home in order to maintain continuous occupancy. Detroit Mayor Mike Duggan believes that the truest measure of Detroit’s success in in whether its population grows. Last week, the city hosted a “Detroit Homecoming” to lure ex-Michiganders back home and announced itself as a “Welcoming City” to encourage immigrants to settle here. There is a bitter irony in Detroit’s eagerness to court new residents while practically daring the ones who have been here all along to stay. It doesn’t matter how much water you throw into the melting pot, if you don’t bother plugging the hole in the bottom, you’ll never fill it up. The truest measure of a city’s success is in how it treats its people, and if mass water-shutoffs and evictions seem like a warning to potential newcomers, all the more reason to change it. This entry was posted in Detroit, Housing, Non-Fiction, Politics/Social Concerns, Published and tagged Detroit, foreclosure, wayne county foreclosure auction. Bookmark the permalink.